Monday 28 Early this morning we were ordered to hold ourselves in readiness to march at a moment’s warning. The 8th and 12th Regiments Iowa Vols. went out on a scout, but returned this evening without having found any rebels. We are building a splendid bake oven. I drilled the battalion in the manual of arms at the request of Colonel Hill. Made preparations to go to the city of Vicksburg tomorrow. Tuesday 29 Very early this morning I started for Vicksburg in an ambulance with Lieut Stewart and Captain Dixon, it was raining quite briskly. 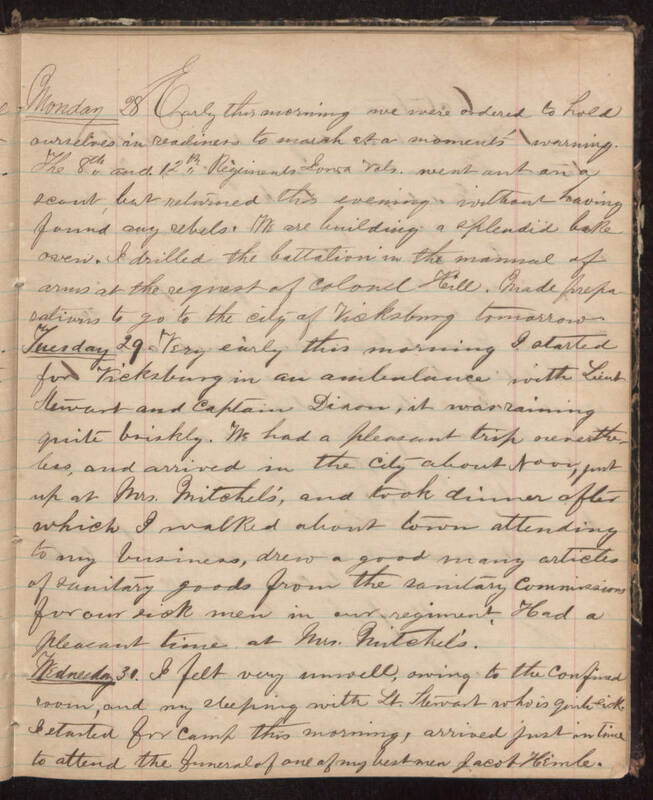 We had a pleasant trip nevertheless, and arrived in the city about Noon, just up at Mrs. Mitchel’s, and took dinner after which I walked about town attending to my business, drew a good many articles of sanitary goods from the sanitary commission for our sick men in our regiment. Had a pleasant time at Mrs. Mitchel’s. Wednesday 30. I feel very unwell, owing to the confined room, and my sleeping with Lt. Stewart who is quite sick. I started for camp this morning, arrived just in time to attend the funeral of one of my best men Jacob Hemle.